Uh oh. That holiday neighborhood party thing is here again—and you still think you can’t cook. You always hope when you ask, “What can I bring?” the answer will be a couple of bottles of wine or a box labeled Godiva. Of course, you could always whip together some cream cheese and grated cheddar with herbs and spices, roll it in chopped nuts, and call it a cheese ball. But you’ll arrive to find 3 others already there. On the other hand, you might like to create some serious doubt about your so-called loose acquaintance with how your kitchen works. 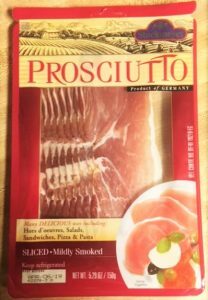 An interesting place to start would be with a package of good quality prosciutto—the dry-cured ham served uncooked. 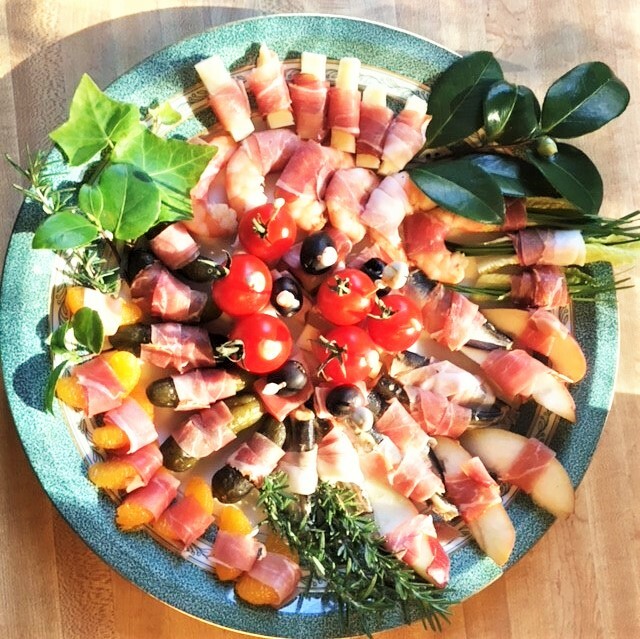 Food lovers from The Cozy Apron food blog to the incomparable James Beard love prosciutto as a party food starter. Start by carefully separating the thin slices of the prosciutto on a cutting board. For the “wraps”, cut ½” strips lengthwise into ribbons –scissors work best for this. For the “stacks” cut the ribbons in ¾” strips. Some of the smaller wrap fillings will need only one-half the ribbon length. Wrap ½” ribbons carefully around: cornichons or gherkins, orange segments, sardines, shrimp, thin cheese sticks, melon strips, pear slices, watercress or chives. Gently press wraps to close. Stack small cubes of cheese or fruit, folded ¾” prosciutto strip, then olive, berry, grape or cherry tomato. Fasten with a fancy toothpick. Arrange all on a plate—garnish with capers, parsley or greenery. No crackers, no dips, no forks, no mess! Just a really good-looking plate of appetizers from someone who really does know how the kitchen works.